Afterwards, the rice is pounded lightly in stone mortars using pestles to separate chaff from the grains then filtered in a bamboo-woven receptacle called “bilao/bigao.” Farmers harvest glutinous rice differently from ordinary rice. They use a hand tool called ‘rakem/iket’ to cut the ripened plant’s stalks one by one. Dudumen rice becomes available in the month of September to November in Ilocos region in the Philippines. The process of dudumen rice cake or in Ilocano inkiwar nga dudumen, is almost the same with the regular “malagkit rice cake”. The only difference is that, the malagkit rice cake is cooked first in a rice cooker before cooking it again in a pan with coconut milk. While the dudumen rice was cooked from the very start on fire and it is sold that way in the market. Click here for the Malagkit rice Cake/Inkiwar Recipe. 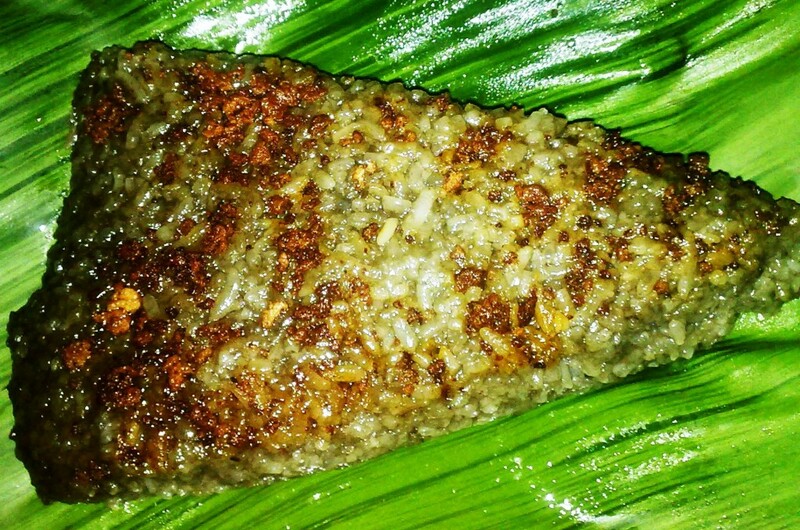 To make a dudumen rice cake, the black grain is cooked in a large pan or wok mixed with coconut milk or in Filipino called “gata ng niyog”. If you want to make the dudumen softer, you soak it in 2 cups of water for 30-40 minutes before cooking it with coconut milk. 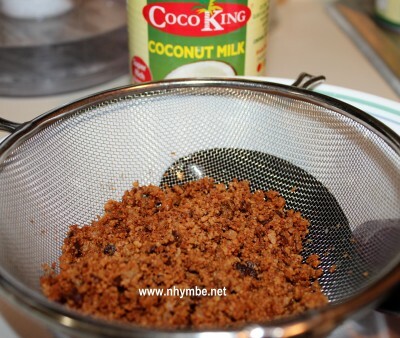 1) Pour the coconut milk in a large pan. continue boiling until coconut oil comes out and the latik is formed. 3) Turn off the heat and remove the latik by using a strainer. Wen iniruban ti awag mi dayta. Just brought some with me and I cooked it with coconut milk YUM! Wen kabsat isu met awag mi dita…ken dudumen. Anya nga parte ka kadi ti Ilocos Region? Sikami ket La Union. Agsasabali gamin ti awag depende nu anya nga lugar ngem maymaysa met lang proseso na nga pinuuran nga diket nga inani ti mano-mano nga rakem. Hehe! Naimas oay nga kanen lattan nga kasta nu kayat mo. Ngem nu ikiwar mo naim-imas manen. Imbag man kabsat ta maka-iyawid ka. Kasatnu ngay panang-preserve? Ibil-bilag mo kadi wenno kasdiay na nga iyawid mo? Iniruban ang tawag ng ibang lugar sa ilocos sa dudumen. ako din miss ko rin ito. pwede po bang post ng recipe.